Is There Seasonality in Forex? With summer months approaching, it would be curious to see whether the FX market is becoming more or less suited for active trading than during the rest of the year. Summer season is usually associated with whipsawing sideways market that offers little opportunities for day trading. In stock trading, they say: Sell in May and go away. Forex traders rarely employ buy-and-hold strategies, though seasonal factors should influence currencies too. There is no lack of studies showing the tendencies of currency pairs to gain or lose during particular months based on the statistics of the past years. However, the implications of those studies are of little practical value. In my opinion, betting on some currency pair to grow in a given month just because the pair rose in majority of those months during past 10 years is a folly. For example, Kathy Lien in her article for Investopedia finds some USD/JPY seasonal cyclicity: 8 out of 10 Julies of growth and 8 out of 10 Augusts of losses for the currency pair in 2000–2009 period. Had a trader picked to start following the pattern from 2010 through 2015, the results would not be fun: 4 out of 6 bearish Julies and 3 out 6 bullish Augusts. Seasonal Charts have 30-year seasonal activity broken down for six major pairs and dollar index. Their EUR/USD chart shows a tendency of the pair to bottom out in June and peak in the end of December during 1982–2012 period. A trader following the trend starting from 2013 would get some moderate profit that year, but would be devastated in 2014, and would also write down a minor loss in 2015. Equity Clock uses 1998–2009 data to demonstrate a disposition of EUR/USD to rise from February 10 through December 31. Following the system in 2010–2015 period, we would get burnt in all years except for 2013. 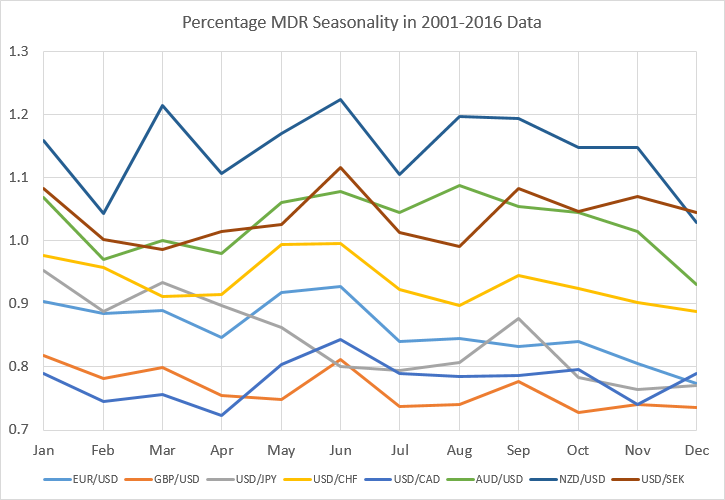 At the same time, I see seasonality as an important factor in Forex trading because daily ranges (average and median) seem to be narrowing during some months and widening during the others. The same can be said about the seasons themselves. There is fundamental difference in how major currency pairs behave during spring, summer, autumn, and winter. 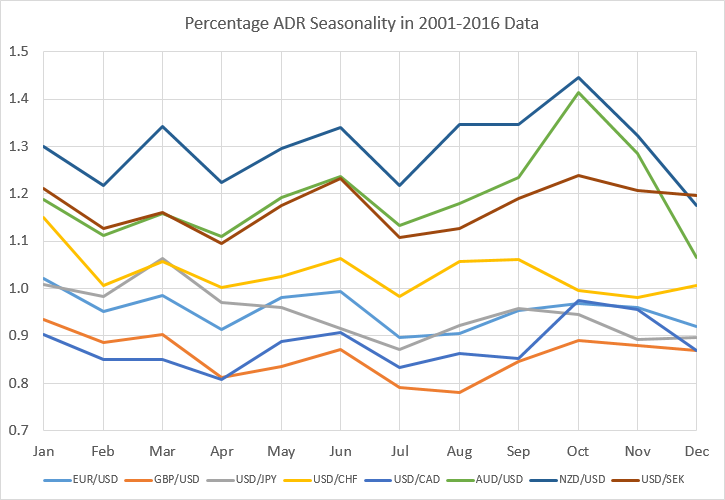 My study of the foreign exchange seasonality patterns is based on the concept of average daily range (ADR) — the mean amount of pips per day the pair has been moving during the period. High ADR (wider High — Low difference) implies more market movement and more intraday volatility to profit from. Consider a day with zero difference between High and Low — it would be impossible to trade within it. Now, a day with hundreds of pips of range is a good foundation for entering some trades. Of course, it also means that the price is more likely to go against the trade’s direction and hit its stop-loss. Calculating average hourly range (AHR) provides additional information regarding the nature of currency rates volatility. It helps answering the following question: Is the ADR high or low due to some one rapid price movement or is it based on long steady intraday trends? When ADR is significantly higher than AHR, it means the former; a lower difference between ADR and AHR implies a more homogeneous distribution of price movement within the day. While average daily range tells us an important thing about the daily ranges — how big they are on average, the median daily range (MDR) help us to understand what range we are more likely to encounter. ADR gets skewed easily with outlying daily range values. Consider a hundred days with 100 pip movement and two days of 1,000 pip movement. The average of that would be 117.6 while the median would be 100, which obviously is a more useful value to traders in this case. Median hourly range (MHR) serves to complement the daily range statistics to improve our understanding of how the daily range relates to hourly ranges. Shall traders expect a multitude of wide-range H1 candles inside each day or is it just a few big intrahour movements that result in high MDR values? Daily and hourly ranges calculated in pips offer a lot of practical value to market operators. After all, pips times position size produce the profit and loss. Overall, the percentage changes in currency rates are very low compared to other financial trading instruments (commodities, equities). FX traders rarely care about the pair’s daily loss or gain percent. However, it is the percentage ranges that enable meaningful comparison between several currency pairs because comparing EUR/USD pips with USD/JPY pips is akin to comparing apples to oranges. In my calculation of the ADR, AHR, MDR, and MHR percentage values, I use the average between High and Low as the denominator for each candle. I have chosen the years 2001–2016 for this analysis because I needed more data. Normally, I would go with post-2009 history to avoid the bias from the financial crisis 2007–2008 and also to make the data fresher — e.g., the real rise of retail Forex trading was after 2005. However, even 2001–2016 range yields only 15–16 observations for the sample size, which is very low by any standard. The last month used to calculate the monthly values is April 2016. The last month used to calculate the seasonal values is February 2016. This is done to avoid a ‘partial’ May and spring of 2016 from skewing the results. The study uses 8 currency pairs — all dollar-based: EUR/USD, GBP/USD, USD/JPY, USD/CHF, USD/CAD, AUD/USD, NZD/USD, and USD/SEK. I have chosen them because they had enough historical price data in MetaQuotes demo server, which I have used as my data source. You can download all the presented tables and charts in form of an Excel file by clicking any of the images below. 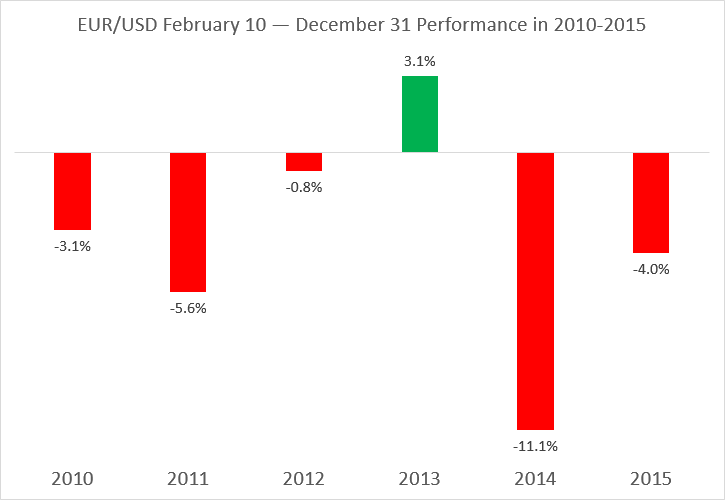 By almost any measure, the most active month for the four currency pairs is January. The lowest-range months are less uniform. EUR/USD fares poorly in December according to median ranges, and in April, July, and August according to average ranges. GBP/USD is worse off in April and August. 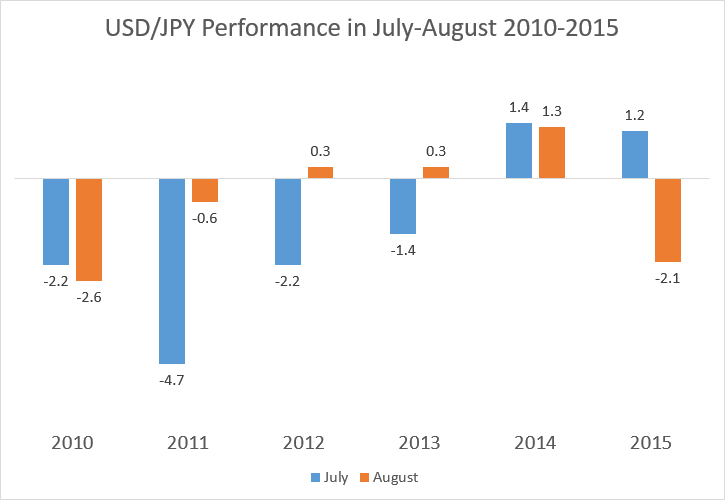 USD/JPY is less active in July and November. Swiss franc pair shows less movement in April, November, and December. Overall, it can be noted that these four currency pairs are most active in winter and spring, and are less active in summer and autumn. Median values are always lower than the average ones. It means that there are more outlying wide ranges than outlying narrow ranges in the price data. Traders can interpret it in such a way that the period’s range will likely be equal to or greater than the median value. Hourly range in USD/CAD is maximized during January while daily ranges are good in June and October. 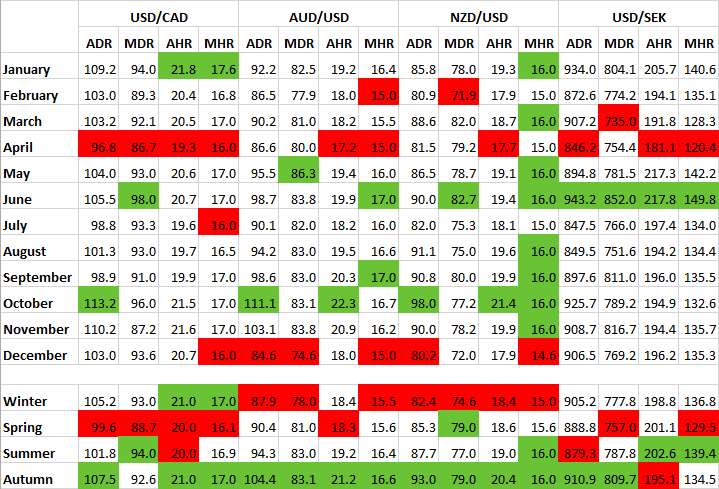 AUD/USD and NZD/USD trade wider in October, May, June, and September. USD/SEK reaches its peak in June. USD/CAD and USD/SEK ranges bottom down in April, while AUD/USD and NZD/USD reach lowest values in December and, partially, in February and April. 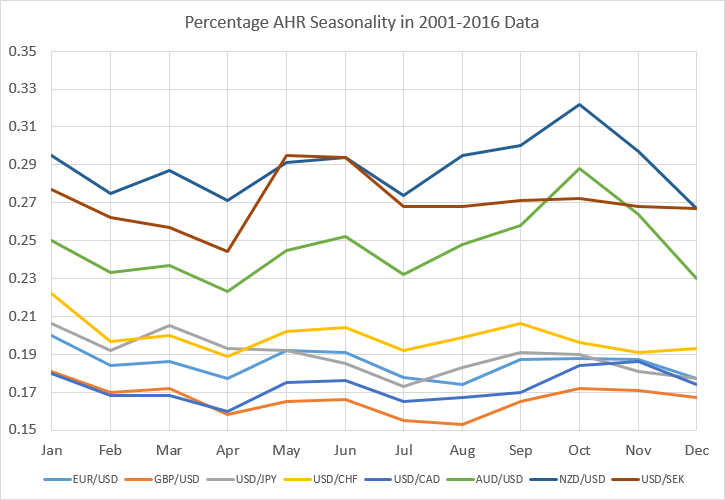 All four pairs show inverse seasonality to the previous set of pairs (EUR/USD, GBP/USD, USD/JPY, USD/CHF) — autumn and summer show more activity than winter and spring. It is the expected behavior for South Hemisphere currencies (Australian and New Zealand dollars), but why is it the case with the Canadian dollar and the Swedish krone? CAD is designated as a commodity currency alongside AUD and NZD. Although SEK is rarely mentioned as a commodity currency, about 30% of Swedish goods export is commodities. 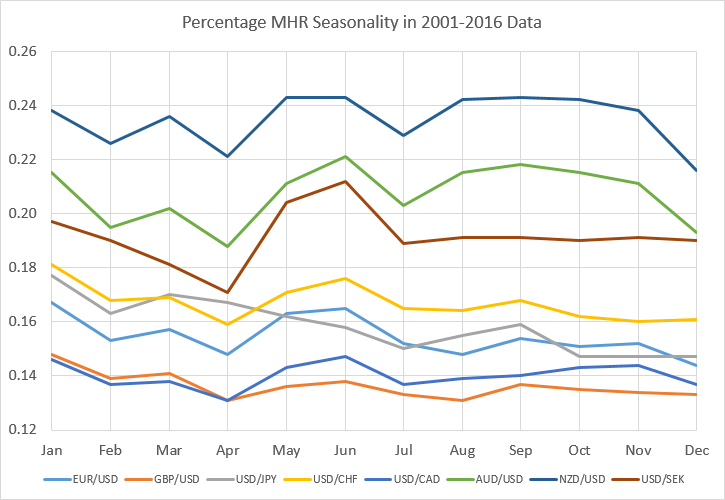 It could partially explain the similarity in seasonal patterns of the group of currency pairs (USD/CAD, AUD/USD, NZD/USD, USD/SEK). 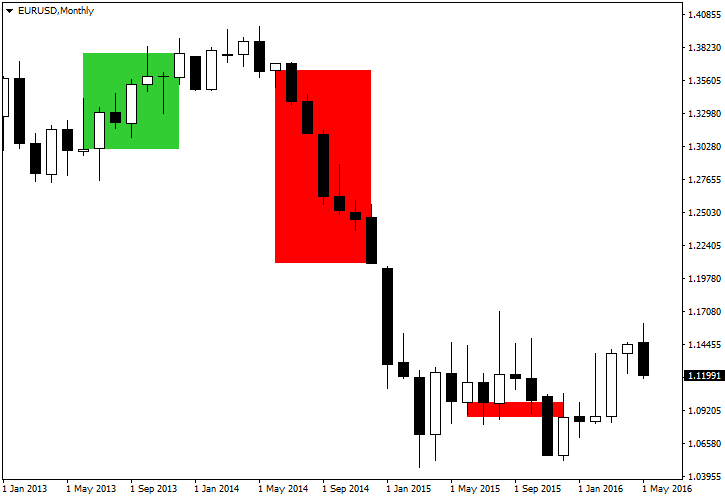 The prominent January peak is retained by all of the four currency pairs when switching to percentage range values. The minimums for EUR/USD remain in July, August, and December. The worst month for GBP/USD volatility is August. USD/JPY ranges are clearly down in November and July (same as in pips measure). Minimums in USD/CHF also remain nearly unchanged — April, November, and December. Maximums and minimums by seasons become even more pronounced, with winter and spring boasting wider ranges than summer and autumn for all currency pairs. June and October seem to be the most liquid months for the four currency pairs, while April and December are the minimum range months for them. USD/CAD, USD/SEK, and AUD/USD (median values) show the tightest ranges in April; NZD/USD and AUD/USD (average values) are calmest in December. Winter remains the worst season to trade AUD/USD and NZD/USD. Spring is a poor time for USD/CAD, AUD/USD, and USD/SEK trading. Meanwhile, it looks like summer and autumn are favorable seasons for all four pairs. Switching from pips to percentage points allows drawing the comparison charts of trading ranges for all 8 currency pairs. Pronounced peaks in March, June, and October along with overall wider percentage movement are evident in AUD/USD, NZD/USD, and USD/SEK here. 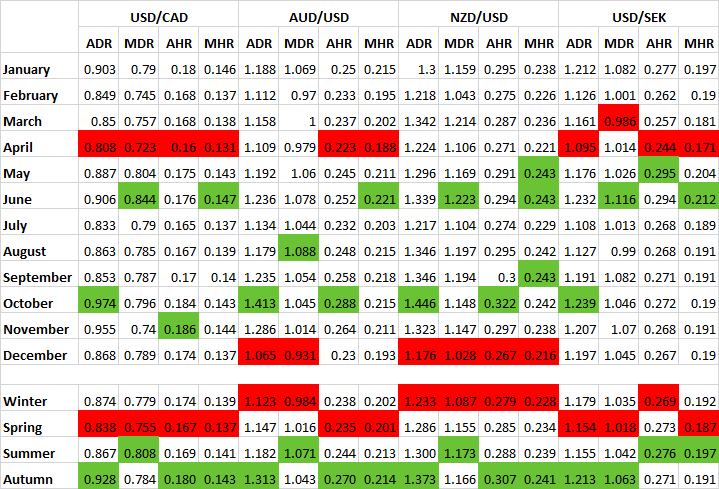 The difference between percentage changes of AUD/USD, NZD/USD, and USD/SEK and the remaining five pairs is even more stark when measuring hourly ranges. October peak in AUD/USD and NZD/USD is an obvious highlight here. April and July troughs are rather apparent. The peaks and bottoms of average daily ranges become less pronounced when switching to median ranges. 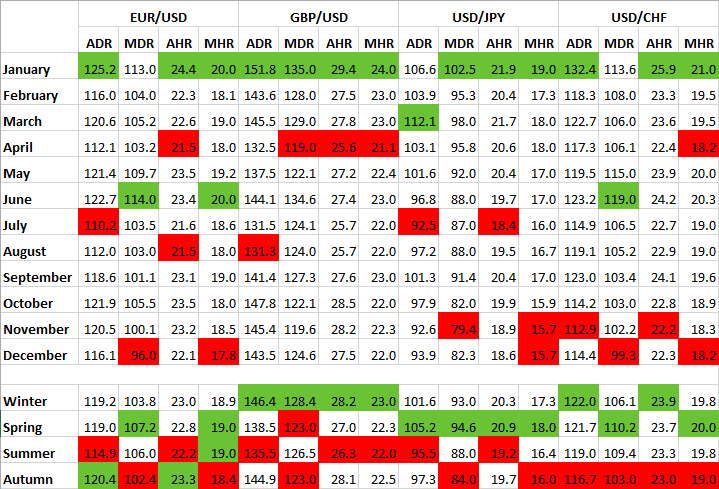 Still, June and September are clearly better than April and December for all currency pairs. The plots of the hourly median ranges are flattest of all analyzed so far. It is evidenced by a short Y-axis. 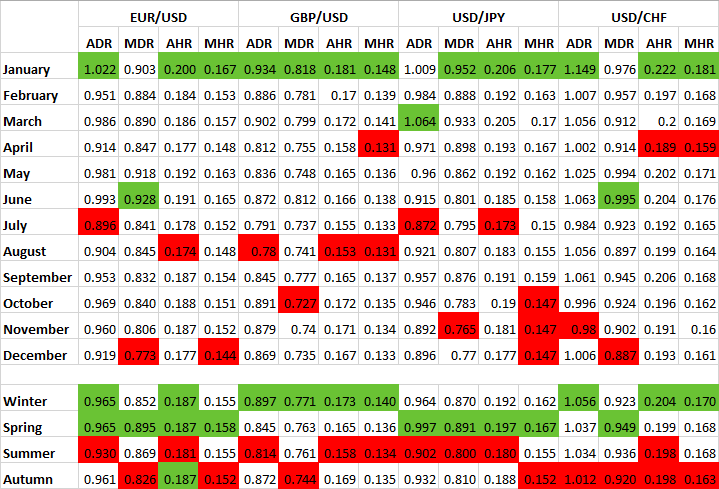 Currency pairs demonstrate minimum ranges in April and December. USD/JPY demonstrates a notable difference in its plot shape compared to other pairs, moving nearly steadily down from January to December. If you want to test the average and median ranges for other currency pairs or on different time periods, you can download the MetaTrader 5 scripts that were used to calculate all the ranges for this post. ADR-MDR.mq5 and ADR-MDR-Percentage.mq5 are very easy to use, but you would still need to change some source code to if you want to test on different years. The presented study is a modest attempt to see what can Forex traders expect from daily ranges of currency rates on different months and during different seasons. It uses 15 years of historical price data to show that some pairs tend to be more volatile during certain periods and calm during the others. An interest point of further research could be the reasons for similarity between USD/SEK seasonal volatility tendencies and those of the South Hemisphere currencies. A notable USD/JPY curve of ranges across months is also worth looking into. Average and median ranges of weekly, 4-hour, and lower timeframes might also show some interesting results if recorded and compared for different months and seasons. Additionally, switching from the ADR to ATR (Average True Range) can also yield interesting results, especially in weekly timeframe, where gaps can be found in Forex rates. My personal experience shows that I enter most of the profitable trades in autumn and winter, some in spring, and very few in summer, while most of my losing trades originate in summer. However, I am not a day trader — my trades last for days and weeks, so they are barely affected by the tendencies found in the current study. And what is your experience with seasonality in the Forex market? What is your favorite season to trade Forex? If you want to share your opinion or ask any questions regarding the best month or season to trade Forex, you can do so using the form below. [Poll] Is Forex Trading Legal in Your Country? How Good Is Sentiment Analysis in Forex? Sharing Is Caring in Forex?